To understand how flatbed UV printing works, we first need to look at the capabilities and limitations of conventional printers. The abilities of any printing machine are defined by the media it can print upon. For example the home inkjet and laser printers are used for primarily printing upon paper. We then have wide format inkjet photo printers which can print on rolls of vinyls, canvas and to a limited extent, cloth. Solvent printers reproduce images on flex hoardings and banners. Finally the huge offset and digital presses can, in addition to regular paper, print on coated and textured sheets of paper and card sheets. Specially manufactured media is needed in each of the printer examples cited above. Wood and pulp need to be pressed into thin sheets of paper. PVC is has to be converted to make rolls of flex or vinyl. Cotton fiber has to be woven into cloth or canvas and then tightly wound into rolls. Only when the media confirms to the requirement of the printer, can it be used for the purposes of printing. The printer sits in its place and paper, or sheets of plastic pass through its innards. Different processes like laser, inkjet or offset printing take place and the print image gets transferred upon the media. The printed media then passes or flows out of the printer and into our hands. But just suppose that you want to print on a block of wood. Have you ever considered pushing in a cricket bat made of pine or willow, into your home inkjet? A sheet of paper curves through the rollers of the laser printer. But how would a sheet of glass do the same. Have you ever wondered if there is any technology that can print directly, on a slab of marble? 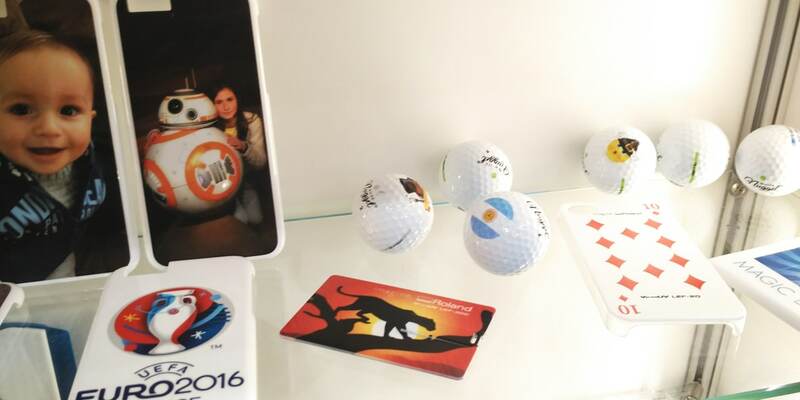 Orchid Digitals, Pune, introduces a new capability of printing directly, onto a variety of rigid objects. We now have a Yotta flatbed UV printer which alters the print paradigm. It changes the way you think about printing by having the ability to print on an entirely new class of materials. You can put in just about any object, inside the machine. And we will print upon it, for you. You think of it and we can probably print upon it. To understand how a UV flatbed printer is different from the other print machines, we need to go back to our earlier examples of inkjet, laser, solvent, offset, etc. printers. In each of these machines, media, confirming to strict set of specifications (like paper size, thickness, uniform flatness, etc.) has to pass in and out of the printer. Remember, the printer stays in its place. It is the media that is always moving. But a UV flatbed is constructed differently. It has a bed or table which is stationery. This table also has inbuilt vacuum suction. The UV print heads are mounted on a gantry that moves along the X and Y axis of the table. When you need to print upon an object, you simply place it on the bed /table. The vacuum suction holds the object in place. This ensures that the object does not shift inadvertently or due to machine vibrations. At the time of printing, the gantry moves the print mechanism in the directions of left / right and up / down. The print heads fitted in the gantry, cover all the area on the print bed. They fire ink on any object placed on the bed and the same gets printed upon. 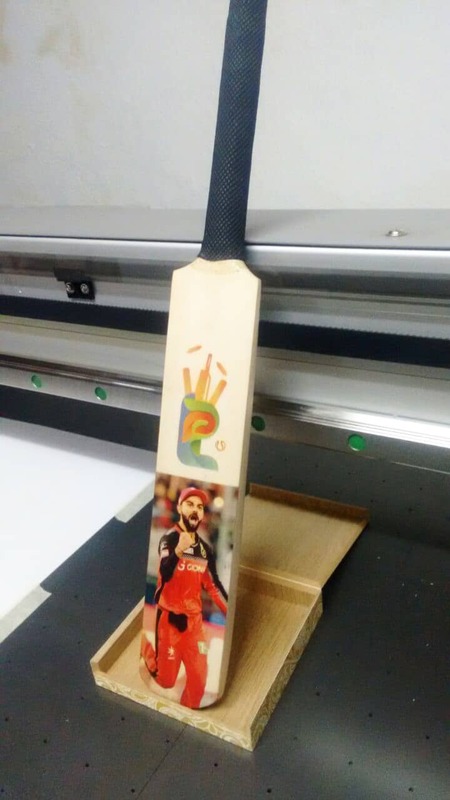 Have a look at this video of an image of Virat Kohli being printed on a cricket bat and the concept of UV flatbed printing becomes clear. 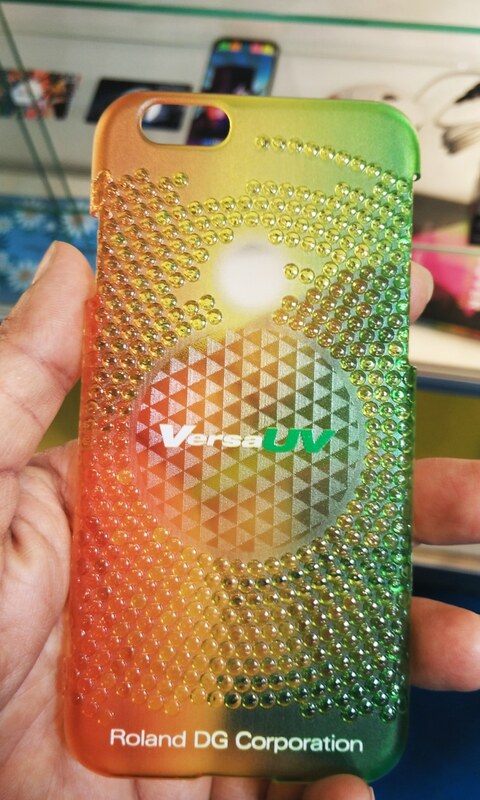 UV inks as the name suggests get cured by ultraviolet rays. These inks are sprayed in a liquid form on the print surface. An ultra violet lamp then passes over the inks and solidifies them in place. Inkjet inks require coated papers to reproduce high resolution images. Laser toner cannot adhere to rough and textured papers. But UV inks are unique in the sense that they are media independent. These inks can be applied to smooth surfaces like plastic or rough surfaces like wood. You can use them to print on stone, ceramics, marble, glass, acrylic, etc. As long as the UV lamps cure the inks properly, they solidify and faithfully stick to just about any rigid surface. 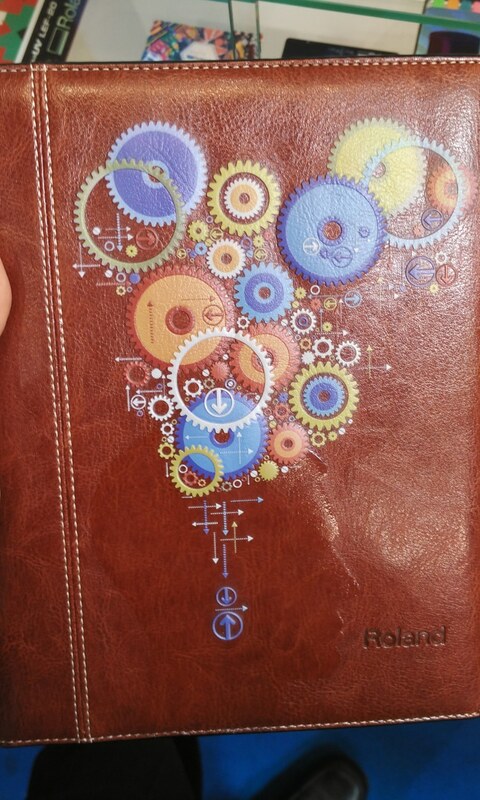 Printing logos and product pics on diaries and folders: Customers bring in diaries and folders from stationers shops. We print company logos and product images directly on to the diaries. 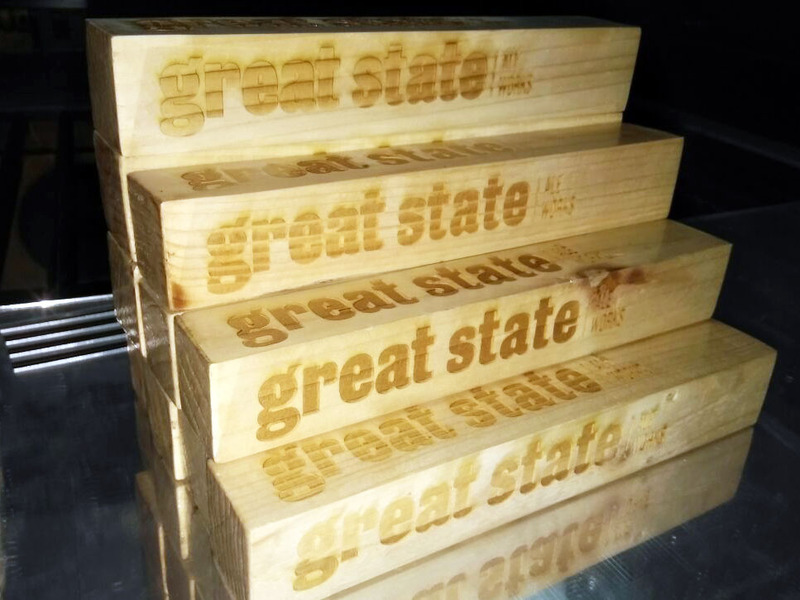 Print on wood: Some of our customers bring in blocks of wood, to be printed upon. Great State Ale Works, a popular microbrewery in Pune, have wooden handles attached to their beer taps and dispensers. We UV printed their logo on the wood handles. Print on ACP sheets: Residential buildings need to install name boards in their lobbies, displaying the names of the occupants. UV flatbed printing can directly print the names on sheets of ACP – aluminum composite panel. 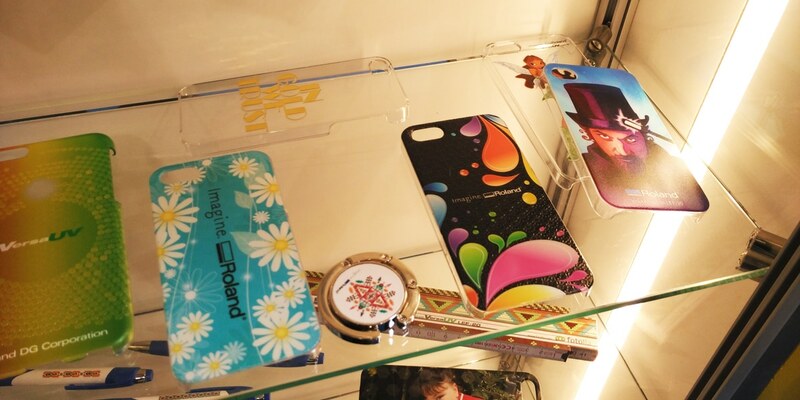 Print on glass: Flatbed UV printing can also be done on the reverse surface of sheets of glass. When you view the glass from the front, you get a beautiful back painted glass effect. Print on acrylic: Flatbed UV printers can be used to print directly onto sheets of acrylic. Company logos, display boards, images, etc. look amazing when printed on acrylic. Print on switch boards, control panels and membrane panels: Control panel printing is another interesting application of flatbed UV printing. Clients bring in their blank panels. We reverse print the company logo, directions, control symbols, etc. directly onto the same. Printing on gift items: Personalizing gift items becomes very easy, using flatbed UV printing. Orchid Digitals can prints on key chains, pens, mouse pads, tea coasters and even peripherals like mouse and keyboards. 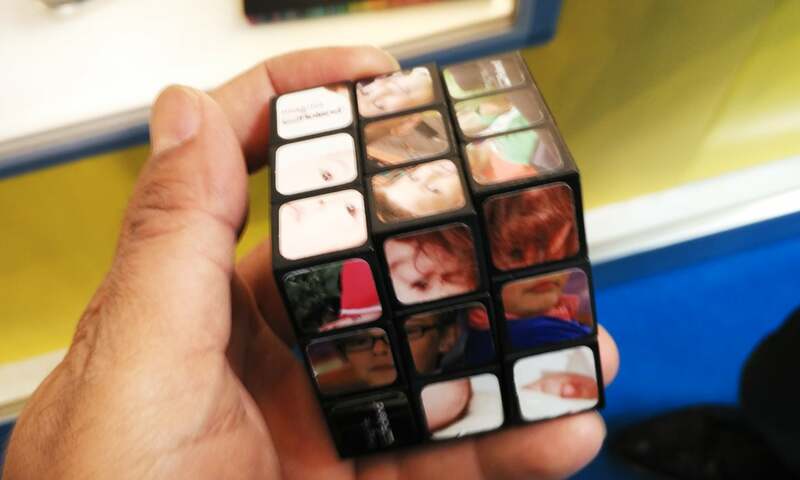 In fact, there was a customer who walked in with a Rubik’s Cube. We printed different images on the six surfaces of the same.